"1.Get a present frum sumone fer Paw It Forward. 2.Post about it on yer blog. 3.The furst three peeple or dawgs or wutever who reply to yer Paw It Forward blog post will git a present frum you. It kin be ennythang and doesnt have to be fancy. 4.Those three peeple or dawgs have to start at number wun. " Those rules are in quotations because they are straight from Dozer's mouth. If you think he "talks" funny just check out his blog to see how much funnier it can get!! Now what Dozer did was instead of sending the PoochesForPeace a present, his mommy donated to the rescue of my choosing! So I'd like to kind of do the same thing. 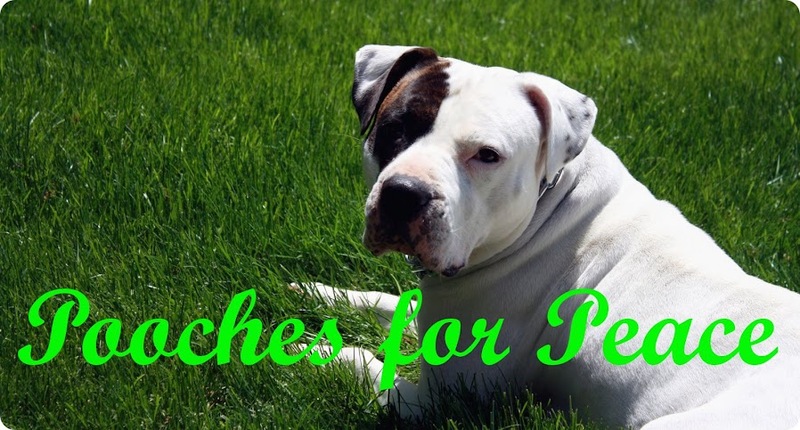 The first 2 people to reply to this will get to pick a non-profit place that likes pitties for me to donate to, and the 3rd person to reply to this will get a present! For the places I donate to, it will probably only be about $10 because I am a non-profit worker myself/graduate student so I don't have much money to spare at the moment! I will give my email address to the winners so you can email me more info! And if anyone could tell me how to put a clickable link in my blog without having to put the whole website name that would be great! @Kari in WeHo: I say you definately can win two, and you can do one however you want! :) I love BAD RAP, someone just got me a hoodie from there for my birthday.